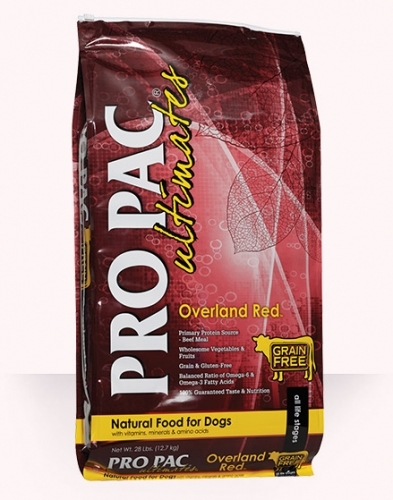 PRO PAC® Ultimates™ Overland Red™ uses a primary protein source from premium quality beef meal which provides essential amino acids to help maintain strong muscle and a healthy, shiny coat. This antioxidant formula is fortified with Vitamin A and Vitamin C along with nutrient-rich natural vegetables and fruits like peas, chickpeas, apples, blueberries, carrots, spinach and cranberries. The natural fibers from these vegetables and fruits also aid in overall digestion. 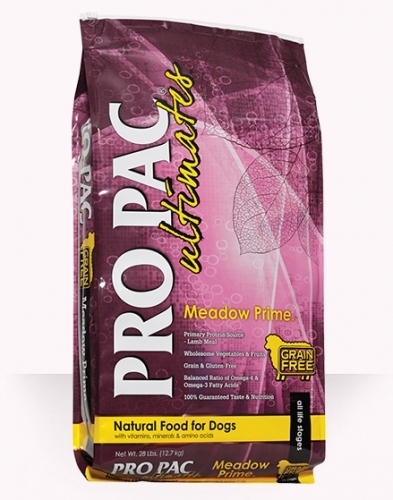 PRO PAC® Ultimates™ Meadow Prime™ uses a primary protein source from premium quality lamb meal which provides essential amino acids to help maintain strong muscle and a healthy, shiny coat. This antioxidant formula is fortified with Vitamin A and Vitamin C along with nutrient-rich natural vegetables and fruits like peas, chickpeas, apples, blueberries, carrots, spinach and cranberries. The natural fibers from these vegetables and fruits also aid in overall digestion. 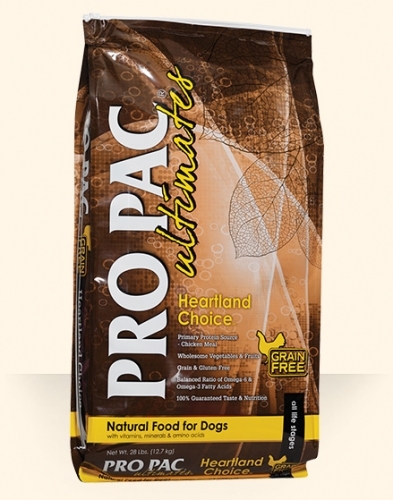 PRO PAC® Ultimates™ Heartland Choice™ uses a primary protein source from premium quality chicken meal which provides essential amino acids to help maintain strong muscle and a healthy, shiny coat. This antioxidant formula is fortified with Vitamin A and Vitamin C along with nutrient-rich natural vegetables and fruits like peas, chickpeas, apples, blueberries, carrots, spinach and cranberries. The natural fibers from these vegetables and fruits also aid in overall digestion. 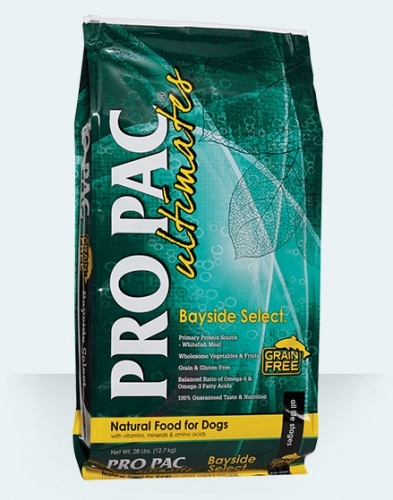 PRO PAC® Ultimates™ Bayside Select™ uses a primary protein source from premium quality whitefish meal which provides essential amino acids to help maintain strong muscle and a healthy, shiny coat. This antioxidant formula is fortified with Vitamin A and Vitamin C along with nutrient-rich natural vegetables and fruits like peas, chickpeas, apples, blueberries, carrots, spinach and cranberries. The natural fibers from these vegetables and fruits also aid in overall digestion. 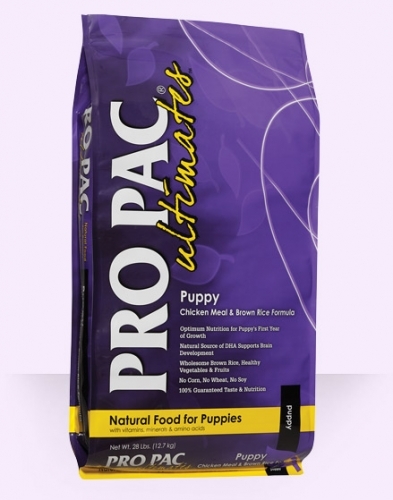 PRO PAC® Ultimates™ Mature Chicken Meal & Brown Rice Formula is scientifically formulated for older or less active adult dogs needing less protein and fat in their diet due to their age or living environment. 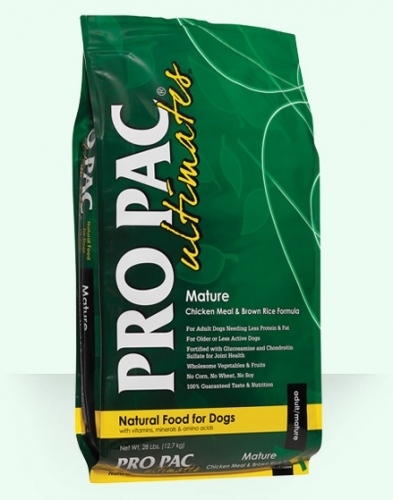 Made without corn, wheat or soy, PRO PAC® Ultimates™ Mature provides the ultimate in canine nutrition. Fortified with glucosamine and chondroitin sulfate, PRO PAC® Ultimates™ Mature Chicken Meal & Brown Rice Formula helps maintain joint health. 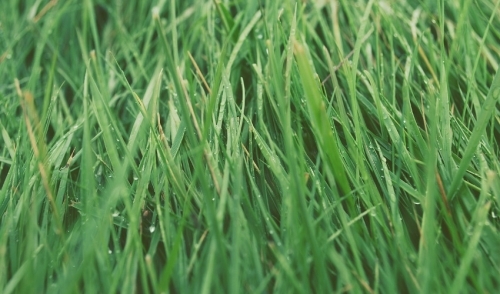 DHA, a type of long chain Omega-3 fatty acid, helps support cognitive brain function. This antioxidant-rich formula is fortified with Vitamin A and Vitamin C along with nutrient-rich, natural vegetables and fruits from peas, apples, blueberries, carrots, spinach and cranberries. Natural fibers from beets, blueberries and cranberries help overall digestion. 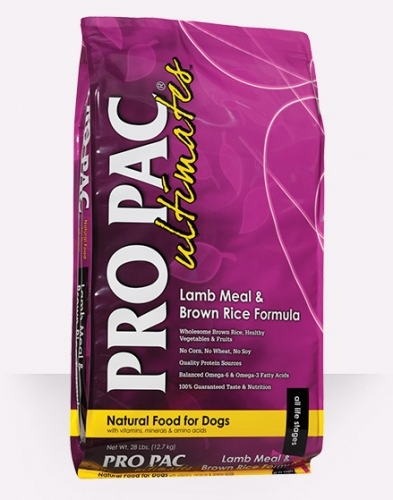 PRO PAC® Ultimates™ Lamb Meal and Brown Rice Formula is made without corn, wheat or soy providing the ultimate in canine nutrition. This formula’s primary protein source comes from premium quality lamb meal, which provides essential amino acids to help maintain strong muscle and a healthy, shiny coat. This antioxidant formula is fortified with Vitamin A and Vitamin C along with nutrient-rich, natural vegetables and fruits from peas, apples, blueberries, carrots, spinach and cranberries. Natural fibers from beets, blueberries and cranberries help overall digestion. 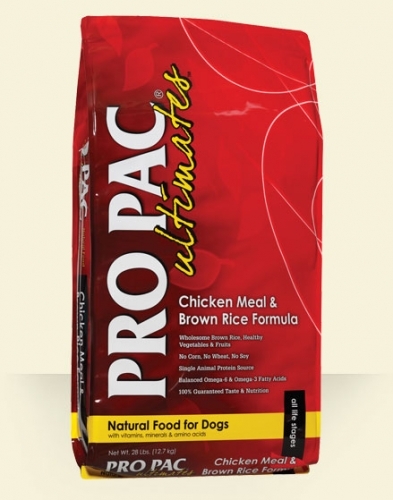 PRO PAC® Ultimates™ Large Breed Adult Chicken Meal & Brown Rice Formula is scientifically formulated to meet the special needs of dogs that weigh over 50 lbs. A precise balance of protein, fat and carbohydrates promotes the special diet large and giant breed dogs need for overall good health. Fortified with glucosamine and chondroitin sulfate, PRO PAC® Ultimates™ Large Breed Adult Chicken Meal & Brown Rice Formula helps maintain joint health. 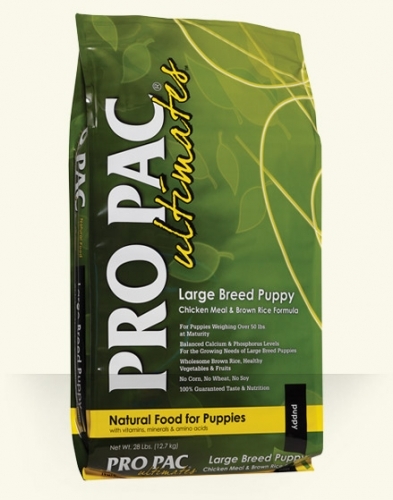 PRO PAC® Ultimates™ Puppy Chicken Meal & Brown Rice Formula is scientifically formulated for puppy’s first year of growth. A growing puppy needs twice the amount of nutrients as an adult dog. The increased level of nutrients provides extra calories for energy and growth and more protein to form muscles, organs and strong bones. PRO PAC® Ultimates™ Puppy Chicken Meal & Brown Rice Formula contains DHA which aids in healthy brain and eye development in puppies. Made without corn, wheat or soy, this special puppy formula provides the ultimate in canine nutrition. This antioxidant-rich formula is fortified with Vitamin A and Vitamin C along with nutrient-rich, natural vegetables and fruits from peas, apples, blueberries, carrots, spinach and cranberries. Natural fibers from beets, blueberries and cranberries help overall digestion. 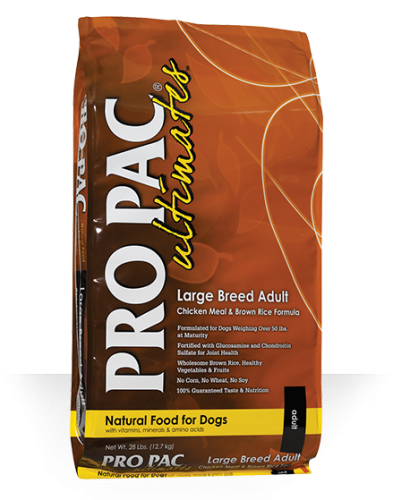 PRO PAC® Ultimates™ Chicken Meal and Brown Rice Formula is made without corn, wheat or soy providing the ultimate in canine nutrition. This formula uses a single protein source from premium quality chicken meal, which provides essential amino acids to help maintain strong muscle and a healthy, shiny coat. This antioxidant formula is fortified with Vitamin A and Vitamin C along with nutrient-rich, natural vegetables and fruits from peas, apples, blueberries, carrots, spinach and cranberries. Natural fibers from beets, blueberries and cranberries help overall digestion.